I’d like to thank ManyBooks.net for selecting me as the featured author today. They posted a nice article about me complete with pictures, even one of my writing desk (which looks a little chaotic, I might add.) Of course, I took the picture and sent it to them. I wanted it to be mostly realistic. I say mostly, because usually my work area looks more cluttered than this. You can see the photo and read the interview at ManyBooks. Me and Annie, 1959, after Annie’s testing. The staff at the hospital shaved Annie’s hair. My mom cut mine. It looks like she set a bowl on my head, but I think the truth is that she stuck a piece of scotch tape straight across my forehead and cut below it. The article leads off with this photo of me and Annie taken in 1959. This was after my parents had taken Annie to Columbus Children’s Hospital for testing because she was over a year old and wasn’t yet able to sit up. They shaved her hair to do the test. It was a very difficult test for everyone involved. I describe it in more detail in Dancing in Heaven. Today is Annie’s birthday. She would have been 58, a year younger than me. Her first birthday, after she was gone, we celebrated the day at my parents’ house. Mom had a helium balloon for Annie, because she loved them. In subsequent years, I always made sure to call Mom to acknowledge the day. Now that both of my parents have joined Annie, I decided to acknowledge her birthday this year with a Kindle Countdown deal. Dancing in Heaven (Kindle version) will be on sale for 99cents today. If you haven’t read it yet, this is a good opportunity to get it at a bargain price. If you have read it, or do read it, I hope you will let me know by leaving a short review at Amazon and here as a comment on the Dancing in Heaven book page, I will answer any questions you might have if I am able. Feel free to ask in a comment. Or you can contact me at my Facebook page Christine M. Grote. This entry was posted in Books, Dancing in Heaven and tagged Books, Care-givers, Cerebral Palsy, Countdown deal, Dancing in Heaven, Kindle, Many Books, Photos, Promotions, Where Memories Meet on May 17, 2016 by CMSmith. 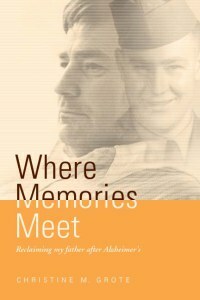 I am pleased to share excerpts from the first Amazon review of Where Memories Meet – Reclaiming my father after Alzheimer’s. The review was done by Grady Harp who has earned the following quality badges from Amazon for his reviews: Hall of Fame, Top 100 Reviewer, and Vine Voice. “Christine’s eloquent tribute to her father’s passage through Alzheimer’s is one of the more valuable books available on the subject of dealing with loved ones who are victims of this relentless disease. The book is supportive, not only to her own psyche for placing her experience in words but also a primer for people who are close to a family member suffering from this ‘distancing’ ailment. Christine’s writing style is straightforward and unhampered with flights of lyricism: those flights occur because of her honesty of style in sharing. . . This entry was posted in Books, Self-publishing, Where Memories Meet and tagged Alzheimer's, Grady Harp, Kindle, Reviews, Self-publishing, Where Memories Meet on October 3, 2015 by CMSmith.